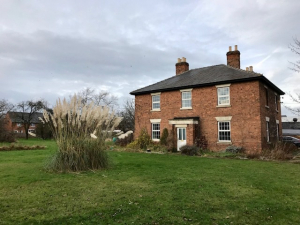 Stenson Fields Farmhouse, Stenson Road, Derby, which has a guide price of £385,000+, sits on a level plot of just over an acre with outbuildings, making it ripe for conversion to a range of smaller properties, subject to planning permission. Alternatively, the new owner may prefer to return the property to its former glory as a family home. The house is partly double glazed and is well proportioned with, on the ground floor, three reception rooms, a sunroom, a breakfast kitchen and rear hall with a guest cloakroom. The focal point of the front sitting room is the ornate cast iron fireplace, while the formal dining room has an open fireplace; both of these rooms overlook the extensive gardens. In addition, there is a lounge through diner which leads to a sun room/conservatory and has access down to the cellar, which has lighting, a vaulted ceiling and retains its original thrawl. This room also leads to the breakfast kitchen, which has the potential to become an outstanding feature of the property, already boasting exposed ceiling beams and a feature fireplace with heavy stone lintel, although the chimney is not open. The kitchen is fitted with a range of units, a twin sink, cooker point and plumbing for washing machine and dishwasher. This room, too, leads to the sun room/conservatory and the rear hall with guest cloakroom. On the first floor are five double bedrooms, four of which retain their original fireplaces or grates, and a family bathroom with a refitted bathroom suite which includes a bath and separate shower cubicle. The rear landing has exposed beams and is large enough to be used as a potential office space. Outside, the property sits on just over an acre of land, mainly lawned, with two driveways. It also features a former stable block, latterly used as garages, which could be converted to residential use, subject to planning consent. The former farmhouse is on the edge of Stenson Fields, not far from open countryside, but with all the benefits of the local community and its amenities. It is just three miles from Derby city centre and convenient for the A50, A38, the Toyota factory at Burnaston, East Midlands Airport and links to the motorway network.